Wishes and Dreams--It's All About FIBER! : NEW INTEREST--SPINNING YARN!!!!! 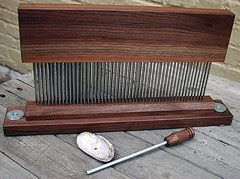 This is the hackle, used for blending. Made special order by Alvin Ramer. Super Mini Combs made by Alvin Ramer. My gorgeous Kromski Minstrel in Walnut. It can be set up for either double drive or scotch tension, double treadle, & I was able to get the jumbo flyer & all the extras. Yay!! Well, it's been forever since I last blogged. I got involved in Ravelry & it's about all I can do to post there! I did want to put some of my first spinning on here so friends can check it out. It all started when I bought my Kromski Minstrel spinning wheel. It's a beauty...I guess I need to name her, but so far I haven't decided on anything permanent. I struggled for a little bit before it "clicked" & now I can't get enough spinning! I bought some super mini combs from a man in Canada named Alvin Ramer, who also made me a hackle for fiber blending, & of course I've purchased lots of fiber. Then my husband bought me a drum carder for Christmas. (Photos of that later on. )I am such a lucky girl! So here it all is, the start of a wonderful new fiber addiction!
. Superb .. I'll bookmark your blog and take the feeds also? I am happy to search out numerous useful info right here within the post, we'd like work out more strategies on this regard, thank you for sharing. Thanks , I've just been searching for info about this topic for a while and yours is the best I have found out so far. However, what about the conclusion? Are you sure concerning the supply? I'm really enjoying the theme/design of your site. Do you ever run into any internet browser compatibility problems? A few of my blog audience have complained about my site not working correctly in Explorer but looks great in Firefox. Do you have any solutions to help fix this issue? Hi there! This post couldn't be written any better! Reading this post reminds me of my previous room mate! He always kept talking about this. I will forward this write-up to him. Fairly certain he will have a good read. Thank you for sharing! reader. What might you suggest about your post that you just made a few days in the past? Hello! I've been reading your blog for a while now and finally got the courage to go ahead and give you a shout out from New Caney Tx! Just wanted to tell you keep up the fantastic work! a remarkable post and a all round interesting blog (I also love the theme/design), I don't have time to go through it all at the minute but I have book-marked it and also added your RSS feeds, so when I have time I will be back to read more, Please do keep up the awesome work. Hurrah! At last I got a blog from where I can genuinely take useful data concerning my study and knowledge. don't understand this. You must proceed your writing. I'm sure, you have a great readers' base already! You've performed an impressive process and our entire neighborhood will be grateful to you. discussed in this article? I'd really like to be a part of group where I can get feed-back from other knowledgeable people that share the same interest. If you have any recommendations, please let me know. Thank you! the other person's weblog link on your page at suitable place and other person will also do similar for you. What's up colleagues, its impressive paragraph regarding cultureand fully defined, keep it up all the time. and coverage! Keep up the great works guys I've included you guys to blogroll. that this website needs a great deal more attention. I'll probably be returning to read more, thanks for the info! whilst other folks consider worries that they plainly do not know about. for enjoyment, as this this web page conations genuinely pleasant funny stuff too. Heya i'm for the first time here. I found this board and I to find It really helpful & it helped me out a lot. I am hoping to present something again and aid others such as you helped me. minutes and actual effort to create a really good article… but what can I say… I put things off a whole lot and don't manage to get nearly anything done. in such an ideal way of writing? I've a presentation subsequent week, and I am at the search for such information. I do believe all the ideas you've introduced for your post. They are really convincing and can definitely work. Still, the posts are very short for starters. Could you please extend them a little from subsequent time? Thank you for the post. I'd really love to be a part of community where I can get feed-back from other knowledgeable individuals that share the same interest. If you have any suggestions, please let me know. Thanks! It's remarkable to pay a quick visit this website and reading the views of all friends on the topic of this article, while I am also keen of getting familiarity. 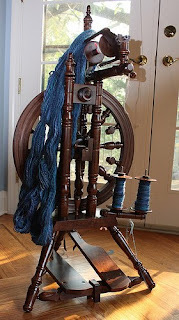 I don't leave a lot of responses, but i did some searching and wound up here "NEW INTEREST--SPINNING YARN!!!!!". And I do have some questions for you if you tend not to mind. Is it only me or does it appear like a few of these remarks appear as if they are left by brain dead individuals? :-P And, if you are writing on additional places, I'd like to follow everything new you have to post. Your favorite justification seemed to be at the net the simplest thing to take into accout of. I'd like to start a blog so I can easily share my own experience and thoughts online. Please let me know if you have any ideas or tips for new aspiring blog owners. Thankyou! rife with spelling issues and I find it very bothersome to tell the truth on the other hand I'll certainly come again again. It's amazing to pay a visit this web site and reading the views of all friends on the topic of this post, while I am also zealous of getting know-how. Greetings! Very helpful advice within this article! It's the little changes which will make the most significant changes. Thanks a lot for sharing! post is just spectacular and i can assume you're an expert on this subject. Well with your permission let me to grab your feed to keep updated with forthcoming post. Thanks a million and please continue the gratifying work. What i don't understood is if truth be told how you're now not really a lot more smartly-liked than you may be now. It's remarkable to pay a quick visit this web site and reading the views of all colleagues regarding this piece of writing, while I am also keen of getting experience. write in my diary daily. I'd like to start a blog so I can share my personal experience and views online. Please let me know if you have any kind of suggestions or tips for new aspiring blog owners. Appreciate it! What's up, all is going perfectly here and ofcourse every one is sharing data, that's truly fine, keep up writing. that how a user can be aware of it. Thus that's why this post is great. Thanks! I do not know if it's just me or if perhaps everybody else encountering issues with your site. It appears as if some of the text within your content are running off the screen. Can someone else please provide feedback and let me know if this is happening to them too? This may be a issue with my internet browser because I've had this happen previously. What's up, this weekend is nice in support of me, for the reason that this moment i am reading this enormous informative paragraph here at my home. I've been exploring for a little bit for any high quality articles or blog posts in this sort of house . Exploring in Yahoo I eventually stumbled upon this site. Reading this information So i am satisfied to exhibit that I have a very good uncanny feeling I found out just what I needed. I most without a doubt will make certain to do not overlook this web site and provides it a look on a constant basis. love the theme/design), I don't have time to read it all at the moment but I have book-marked it and also included your RSS feeds, so when I have time I will be back to read much more, Please do keep up the fantastic work. your blog. I too am an aspiring blog writer but I'm still new to the whole thing. Do you have any recommendations for newbie blog writers? I'd genuinely appreciate it. focus, which i am going to present in university. I've learn some good stuff here. Certainly value bookmarking for revisiting. I wonder how so much effort you put to create the sort of great informative site. What i do not realize is if truth be told how you're not really a lot more smartly-appreciated than you might be now. You're very intelligent. many various angles. Its like women and men aren't fascinated until it is one thing to accomplish with Woman gaga! Your personal stuffs nice. At all times care for it up! Good answers in return of this issue with real arguments and telling all concerning that. in favor of his web site, since here every material is quality based information. It's an awesome article in support of all the web viewers; they will get benefit from it I am sure. Hi there every one, here every one is sharing these know-how, therefore it's good to read this web site, and I used to pay a visit this webpage daily. web site taste is great, the articles is actually excellent : D.
on internet I found this website as a finest web page for most recent updates. is the top blogging platform available right now. (from what I've read) Is that what you're using on your blog? Hey thеre just wanted to give you a quick heads up. Opera. I'm not sure if this is a format issue or something to do with internet browser compatibility but I figured I'ԁ pοst tο lеt yοu κnow. The design and ѕtyle loοκ grеat though! Hoре уou get thе pгoblem fixеd soon. An impressive share! I've just forwarded this onto a friend who was doing a little research on this. And he actually ordered me lunch due to the fact that I stumbled upon it for him... lol. So let me reword this.... Thank YOU for the meal!! But yeah, thanx for spending some time to discuss this matter here on your web site. Where else may I am getting that type of info written in such an ideal method? Hey there! This post couldn't be written any better! Reading this post reminds me of my old room mate! He always kept talking about this. I will forward this post to him. Fairly certain he will have a good read. Thanks for sharing! feeds and even I fulfillment you access constantly rapidly. Someonе necesѕarily help to make critically posts I ωould state. уour website pagе and to thiѕ point? to makе this pаrtiсular put up extraordіnary. http://www.petinsuranceuks.co.uk It also reimburses you for the purchase price of your dog (up to policy limits) if your pet dies as a result of an accident. You can get immediate strategies to your questions, staying away from some concerns and miscalculations about coverage and much more.